Spring is finally here! I know, technically its been here for like two weeks already, but I'm finally just starting to believe it. The weather has been so nice these past few days, and I've been breaking out all the off the shoulder tops and sandals! Spring is always my favorite season in terms of fun fashion, because it's always full of bright colors and fun accessories. But like anyone else in college, I don't exactly have the budget to be spending a lot on clothes. 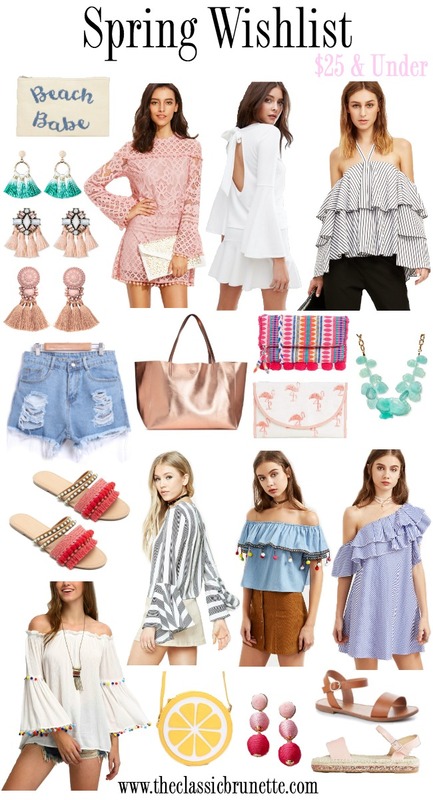 So I've rounded up all my favorite clothes and accessories that are $25 and under so that you can have all the fun of spring trends without breaking the bank! One of my favorite items that I found is this pink lace pom pom dress for only $24! I think this dress might be my favorite dress of the season, because it's so fun and feminine. And for the price I'm not afraid to buy a trendy piece like this, however I think that the pom poms are pretty subtle anyway. I'm so excited to add this to my closet.Speaking of pom poms I was also thrilled when I saw this white bell sleeved top with colorful pom poms! With the bell sleeves and the off the shoulder details, this is going to be such a great blouse for the warmer months. I'm thinking this top would be great for a beach day if you paired it with denim shorts. I've also been obsessed with Baublebar's new line at Target! Their accessories are so pretty, and way less expensive than the stuff from the Baublebar website. I picked out a few favorites like these Teal Ombre Earrings that are so perfect for spring. I can't believe these are all $25 and under!!! These are some amazing find! Love all your picks! I just bought the pom pom sandals and I love them! I want that pom pom off the shoulder top! Gahh!! I want it all! You have fabulous taste in style!! Love this post!! Such a good idea. I love the way it is set up with that photo and all of the link below it! I want everything!!! So much cute stuff! I need those shorts and those pom pom slides! I need to do some shopping now! I was looking at all of them like, I want that and that and that. I kind of want everything on this list! i am loving all the ruffles and bell sleeves! Everything is SO springy! I love the selection Sam! I want each piece in my closet! I literally want everything you picked!! I am beyond ready for a summer vacation so I can wear all of these cute clothes!! I love your picks! I want all the items. Thanks for the inspiration. Loving ALL of your picks. My fav is the ruffle top. Can I get one of each, please? Loving all of those earrings and the black and white striped ruffle top!! EEEKKK... Love every single thing and need those blush earrings! SO many good finds and all under $25.... I might just need them all! These picks are all amazing.... I love the earrings girl!! Yessss! This list is getting me so pumped for spring. Those tops are the cutest! The rose gold tote and tassel earrings are my favorites on this list! So many fun and trendy items for the upcoming season! Striped Bell Sleeve Top - goooorgeous! I jut got myself one similar from Zara on sale ;)) Loving it so much! this roundup is so fun! I love those fringe sandals! These are all so cute! I totally wish I was going on a beachy vacation this year. Those tassel earrings are so cute!! Love this list! I've been eyeing that pink dress that is SO cute!! Can I have it all please?! Great round up!! I ADORE that striped open shoulder top. That is SO cute! I have had my eye on that lemon crossbody forever! I love all your picks! That pink dress is great!